Disclaimer: I was heavily involved in aspects of the design of the new PACT website and gave advice on the development of many of its current features and functionality. The Peace and Conflict Timeline (PACT) website by the Centre for Poverty Analysis (CEPA) is one of the most innovative I have encountered. It’s idea is original, it’s content very well research and it’s presentation immaculate. It’s rarely that you come across an idea that makes you wonder why no one thought of it before. PACT is one of them. While the PACT concept won it an award of merit from the Society for New Communications Research (SNCR) in 2007, the website at the time was an unmitigated disaster. One of my first emails to CEPA late December was a lengthy one with several detailed ideas on how they could improve the site. I’m happy to note that most of them find expression in the new avatar. There’s a clear list of issues the site covers on the right – clicking on any one of them brings up associated events. Else, you can browse through the timeline – clicking on a year brings up information related to that year. The site makes very good use of AJAX – everything is fluid and very responsive, even on a slow internet connection, aided by the absence of bandwidth hogging graphics. Well thought out submission guidelines will hopefully ensure that that the fringe lunatics, racists, trolls and nut jobs that usually latch on to sites like these are kept at bay. This is important since as PACT evolves, it will have to judge what to publish in terms of comments, keeping the overall tone of conversations on the site civil, progressive, interesting and light. This is my first worry – from what I know, PACT has little real institutional support in terms of human resources. Though it will largely be a site for reading / research more than discussion, the fact that it encourages feedback means that serious consideration has to be given to site moderation and what it will entail. I know from experience that many organisations haven’t the foggiest as to how much of work this really is. Do it badly or haphazardly and the entire site goes down. What’s also interesting is that the site allows you to subscribe to new events and new comments. New events don’t necessarily mean contemporary events since PACT will add events in the past as and when necessary. The ability to subscribe to comments and posts via RSS and email is great and avoids the common mistake of assuming that readers actually like to come to a website to access new content. The first site ran on some half-baked home made content management system that was an unmitigated disaster. To this day I find it shocking that anyone at CEPA thought it was fit to go up the way it did. Mistakes have been learnt from and the new runs on the extremely robust WordPress (2.5.1) platform, which means that it is scaleable, can be accessed through a variety of devices, can be easily referenced and embedded in other blogs and just makes the content in it more easily accessible. Something for all Mac users using Safari to watch out for though. If you intend to register and write something to PACT using the WordPress, some plug in that’s active on it make it extremely unstable. Safari (3.1.1 on Leopard) crashed twice as I was trying to type in something, which is very unusual yet something to keep in mind. There’s another small problem. An incorrectly configured submission URL on the Suggest an event page actually prevents anyone from suggesting an event. In the absence of anyone from the general public suggesting an event, all that’s on the site are suggestions by the PACT team. What’s not entirely clear to me is why they remain as suggestions, with the only explanation being that the research needed to enter these into the PACT database is hostage to the limited time available for the administration of the site by the one person I know is behind it almost single handedly. Three features I would really like to see on the site I’ve already communicated to those in charge. The first would be to plot on a map of Sri Lanka the locations of incidents in PACT. The geo-visualisation of incidents and events would give a user a perspective much wider and deeper than reading the same information in a textual format, just like the Mideast Conflict Timeline. Another is in the visualisation of information proper. I remember using Microsoft Encarta’s timeline and discovering a range of events and processes that I would not have pieced together as easily by reading just text. 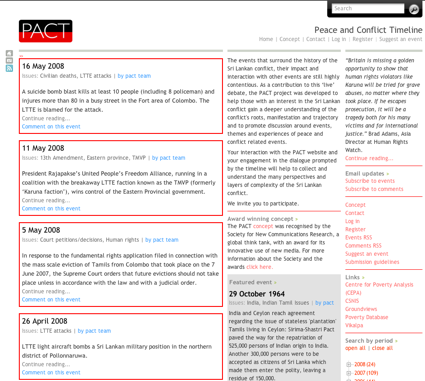 There’s actually a very powerful example of what I would like to see for PACT in the form of the Xtimeline website. For example, see this history of the microprocessor – beautifully done and extremely intuitive. Finally, a way to make PACT more social. The suggestion here is to include ways through which each post can be more easily integrated into a range of social networking sites like Facebook and Myspace. This can be very easily done by integrating Addthis to their site. PACT is a must for any researcher on our conflict and is one of those sites that really should be put as a shortcut on the desktops of PCs in libraries and cyber-cafes, so that people actually get to know of it and use it. Traffic to the site will never be comparable to a other sites on conflict including those such asGroundviews or Vikalpa, but what is offers is content that complements, strengthens and gives more insight into that which is published elsewhere. It is truly sui generis in this regard. Visit it today. Whilst PACT was recognised by the Society for New Communications Research (SNCR) for my concept and initial efforts, I am grateful to Sanjana Hattatuwa for his suggestions on how to get the most from a revamp of and for reinforcing to us the selection of the WordPress platform as the most suitable. The current site has been expertly fine tuned by our consultant, Cezar Neaga, who continues to work on the technical side. PACT now boasts audio, video and photography content relating to historical and contemporary conflict events.